Lepidium meyenii, known commonly as maca, is an herbaceous biennial plant of the crucifer family native to the high Andes of Peru around Lake Junin. It is grown for its fleshy hypocotyl. This herb has been traditionally used as an aphrodisiac for both men and women, to increase energy, vitality, stamina and endurance in athletes, promote mental clarity, for fertility and to increase male seminal fluid volume, sperm count and sperm motility, for treating male impotence and erectile dysfunction, some say, its the herbal viagra for both men and women, and for female menstrual irregularities and hormone imbalances, including menopause and perimenopause. Women with menstrual irregularities have experienced greater consistency, while women with hot flashes, mood swings and most associated perimenopause and menopause symptoms have diminished dramatically. Due to the number of steroidal glycosides present in Maca root it is gaining popularity among weight lifters and body builders as a natural alternative to anabolic steroids. In modern society, the competition becomes more and more drastic and the psychological pressure turns higher and higher, the rhythm of life becomes faster and faster, and the pollution of living environment is increasingly serious. As the principal work force of family, the health of the reproductive system of man becomes more and more important. In general, male diseases include impotence, prospermia, infertility, which is the general designation of the diseases of prostate and male reproductive organs. In real life, more than 20% of male adults have varying degrees of male diseases. 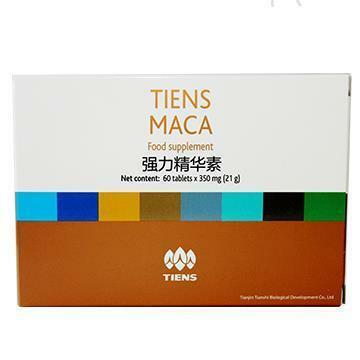 Maca is made in accordance with the principles of traditional Chinese medicine (TCM). At present, the popularity of maca worldwide is growing at an enormous rate. Has a reducing effect on diastolic arterial pressure (lowered blood pressure). Has an anti-anemic effect (balanced blood iron levels). Has an important effect as energizer, possibly due to it's effect of causing an increase in the serum levels of human growth hormone (HGH). Effects blood sugar energy reserves (hemoglucose) acting over body fat (promotes the use of glucose in the bloodstream for energy rather than being processed into fat storage). Maca was found to produce a "general sense of well-being". DHEA level increases significantly in a majority of the males treated with maca. Decreases anxiety within the first two weeks of treatment. Treatment with maca decreases stress. increases seminal volume, count of mobile spermatozoids and mobility of spermatozoids (average sperm count increase in the maca group vs. the placebo control group was 200%). Maca increases adrenal androgens (adrenalin). University-sponsored clinical trials show 180% increase in sexual desire (libido) and 200% increase in male's sperm count. Tiens range of health products is inspired by a 5000 years old Chinese health-preserving culture. Copyright © 2019 Tiens Tianshi. All Rights Reserved.